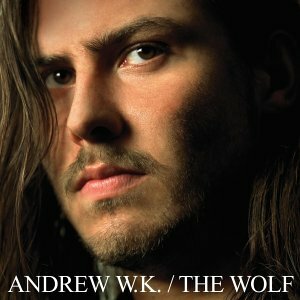 The Wolf has some noticeable changes when compared to Andrew WK’s debut effort, I Get Wet. The most striking of which is that the overly sleek, everything-must-be-as-loud-as-possible approach that left all of the instruments in uniform before has been abandoned in favour of creating a more varied and dynamic album. This can be seen through the introduction of flashy guitar leads, louder and improved drum work as well as keyboard/piano playing that comes to the forefront on occasion. He no longer relies on the simple mantras to be the focal point of each song and has instead opted to replace them with longer verses with marginally less repetition. The lyrics tend to deal with motivation, life and positivity in addition to the love and party themes that Andrew WK has become known for. While sometimes singing clearly, he also falls into a throaty singing voice that isn’t always easy to understand and can feel out of place at times now that the tempo has been cut back across some of the songs. The expansion on his established style prevents him from becoming a self-parody and won’t alienate his core audience anytime soon with this album as he has managed to put enough new material forward to keep the listener engaged without thinking that it is just a reworking of his last effort.